After a nearly year-long negotiation, the University of California reached a provisional labor agreement with the Teamsters Local 2010 union on March 23. Since about 70 percent of UC Teamster workers struggle with hunger or food insecurity, the union demanded the UC increase wages and bonuses and provide better healthcare for its workers. In the new tentative contract, the two parties agreed on a compounded wage increase of 19.4 percent over the next five years, a $1,200 bonus per clerical employee, competitive health insurance and retirement option flexibility, according to a UC news release. Teamsters will have an open contract, meaning the union will be able to renegotiate the contract before it expires on March 31, 2022. This will depend on whether or not other UC unions negotiate higher salary increases during that time. Teamsters employees from all UC campuses will vote before April 14 to approve the new contract at their local union chapters. The ballot counting process begins April 19 and Teamsters employees at UCSC started voting on April 4. If the Teamsters union votes to ratify the new contract, the UC administration must pay the increase and the bonus lump sum no later than 60 days after ratification. Food insecurity among UC employees is more than five times higher than California citizens and in the nation as a whole, so this contract has the potential to alleviate financial burden from thousands of workers. 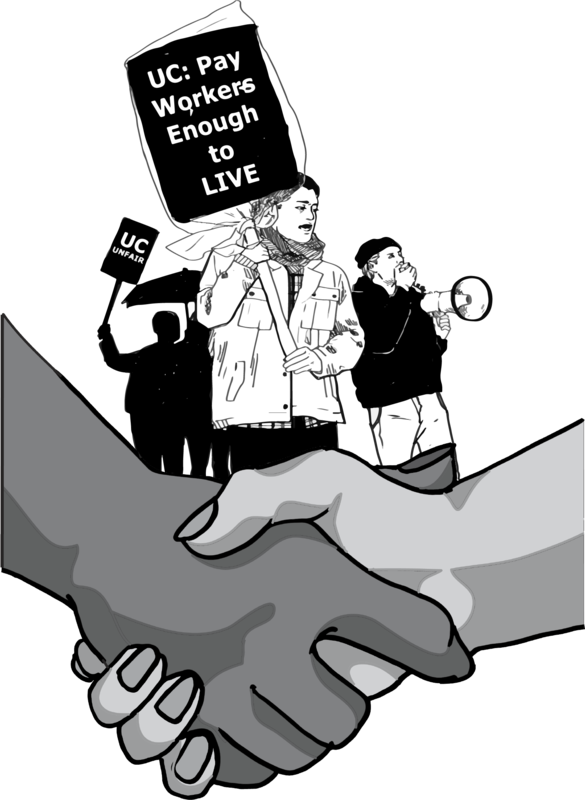 During the negotiations, Teamsters held two official UC-wide strikes to combat unfair wages. In the first strike, on Nov. 16 last year, Teamsters rejected UC’s proposal of a 1.5 percent annual pay increase over the next five years. The union did so because it saw the proposal as inadequate, considering its workers’ wages have decreased 24 percent over the last 18 years.